CHESMA, AC and the JC3 are non-denominational, and welcomes different expressions of Jewish religious/spiritual service. At present, there is both a weekly Conservative minyan (Kehilla Shalom San Miguel de Allende) and a monthly Reconstructionist/Reform/Renewal group that meet at the Center. 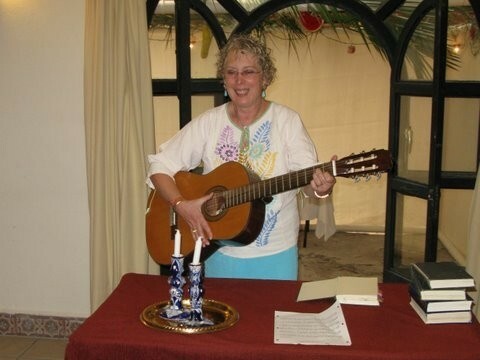 Any member wishing to lead another style of Jewish worship at the JC3 is urged to contact Ritual Committee chairperson Dan Lessner at their earliest convenience. Help make the JC3 your spiritual home away from home! Join us for a joyous song-filled worship service, led by Dan Lessner, our spiritual leader, in traditional/egalitarian Conservative style. Following this tradition, we need a minimum of ten Jewish men or women to read from the Torah, chant Kaddish and other key prayers. Help us fulfill this mitzvah by being a part of our minyan. Our prayer book is fully translated and transliterated phonetically into both English and Spanish. Greet the Sabbath with us with our popular monthly Friday night get-togethers at the JC3. See Calendar for details. Come celebrate a festive, musical Friday night English-dominant service and meal. Please contact the JC3 office at 415-185-9191 or via email shalomsanmiguel@yahoo.com.mx for more information or to RSVP. Our community observes most Jewish holidays.